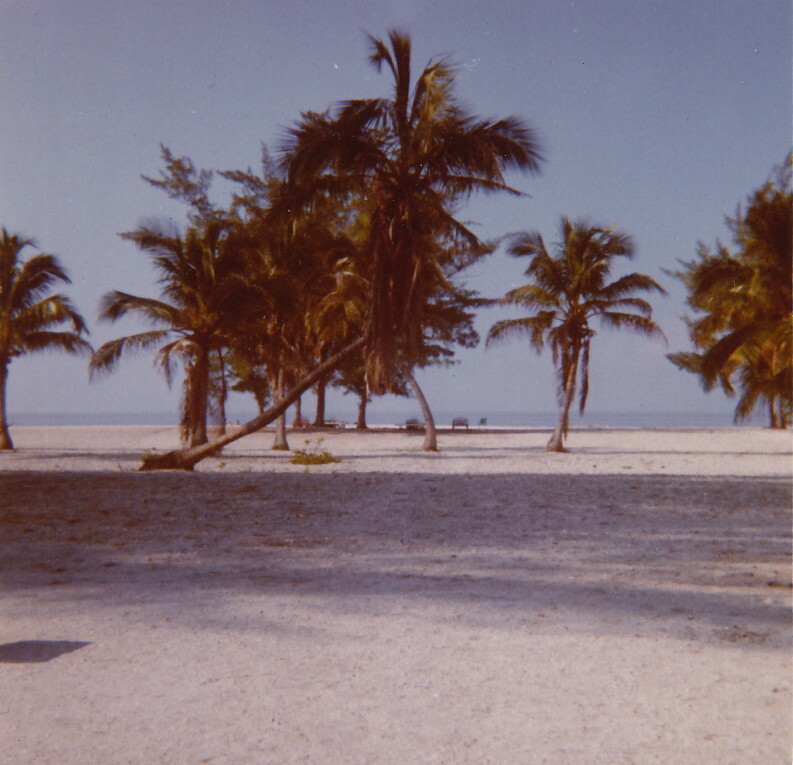 During our time in Venezuela, we spent three summers on Sanibel Island, Florida, in a little resort called Hurricane House. As best as Tim and I can remember, the years were 1969, 1970, and 1971. Tim took these photos in 1970; our brother Paul shot the picture of Tim. It was on one of these trips that I lost my Tin Man. It still haunts me. 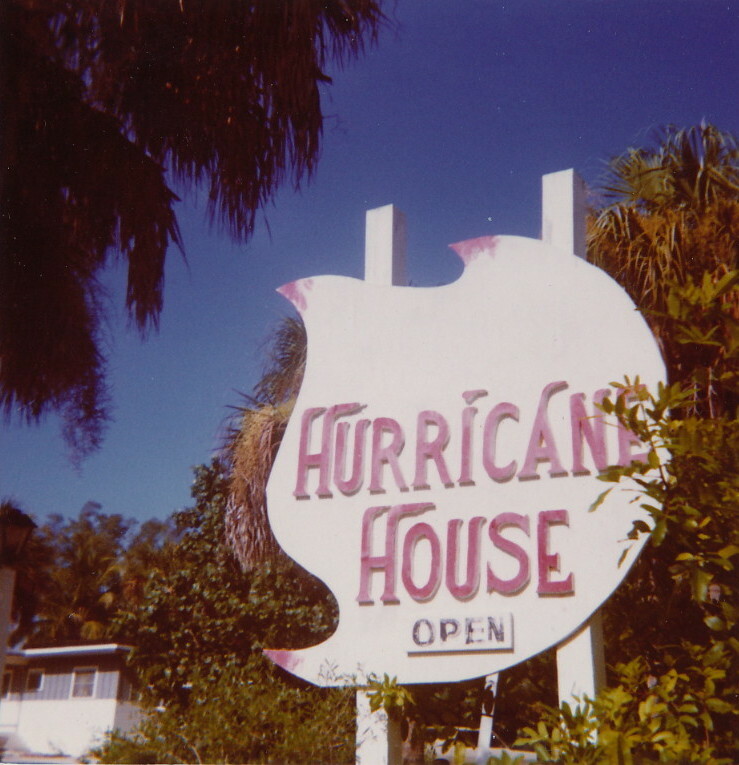 Hurricane House was run by the Kern family. The elder Mr. Kern was just a nice, white-haired old man. His middle-aged son had that typical male-pattern balding, and he was muscular and hairy as an ape. Though he smiled a lot, he also threatened to spank us. He’s the second adult male I’ve heard say, “There’s going to be a lot of warm little bottoms around here in a minute,” so maybe that’s a standard line of dialog that men delivered back in the late sixties. Here’s the weathered sign for Hurricane House. In the background is one of the cabins where we stayed. Even back then I wondered why you’d name the place “Hurricane House.” Who wants to take vacations in the middle of hurricanes? Humphrey Bogart’s best film Key Largo gives you a good idea of what Florida hurricanes are like. 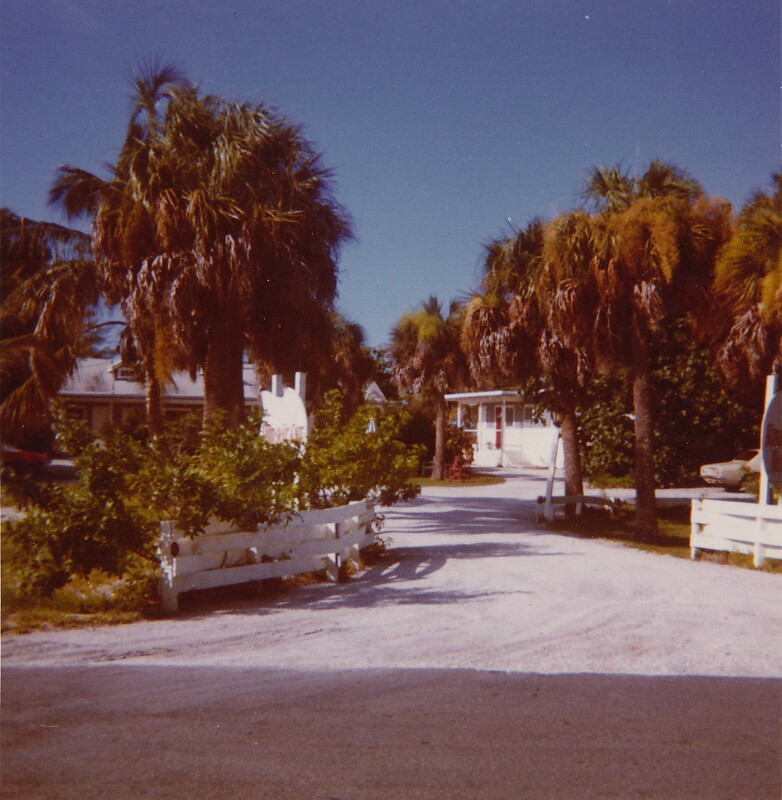 The driveway leading into Hurricane House had two canals behind those white board fences. In each canal lived an alligator. When we first stayed there, the Kerns told us to never go down to the canals by ourselves, especially at night. So we didn’t. They trusted us, even though we were little kids. Can you imagine that happening today? Adults treating children as though they had common sense, or resorts having wild alligators in unfenced canals right in front? At dusk the alligators would bellow, a totally primeval, hair-raising sound. I think one gator was named Archie. We weren’t afraid of them at all. In fact it was fun to have alligators so close. 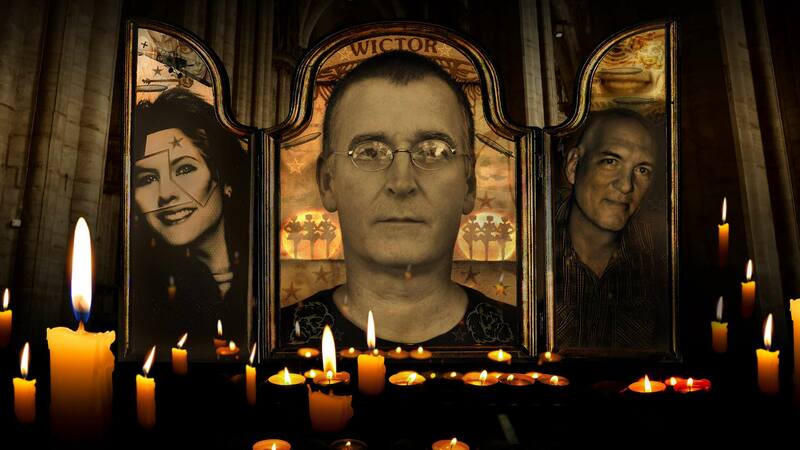 The Wictors inside a cabin. 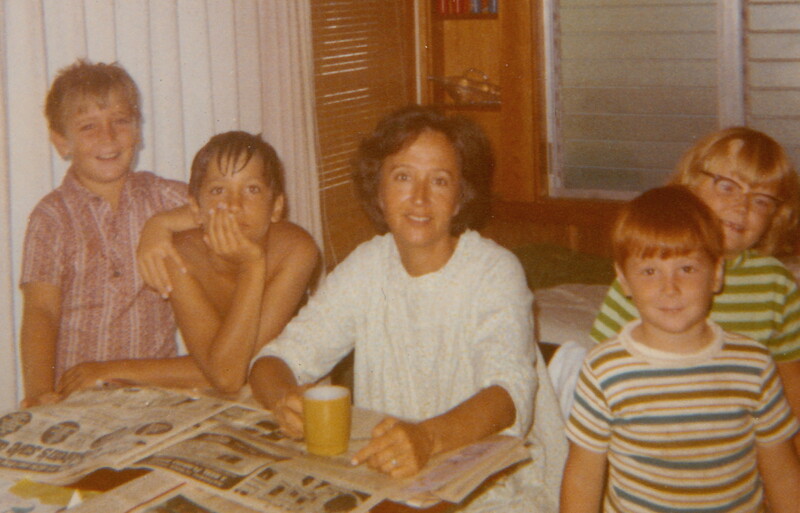 From the left: me, Paul, Mom, Pat, and Carrie. Tim isn’t there because he took the photo. This is the picture of Tim that Paul took the same year. Yeah, that’s pretty much what Tim was like in those days. 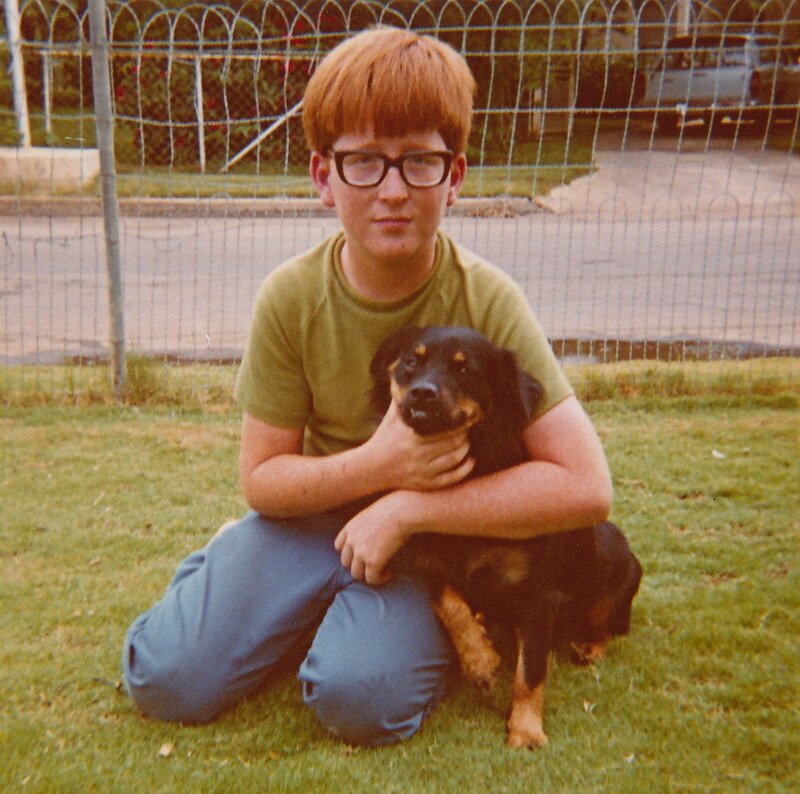 He’s restraining our dog Charlie, who’s thinking, “I’d…like to be somewhere else, fellas. Okay?” Look at his poor right front paw. 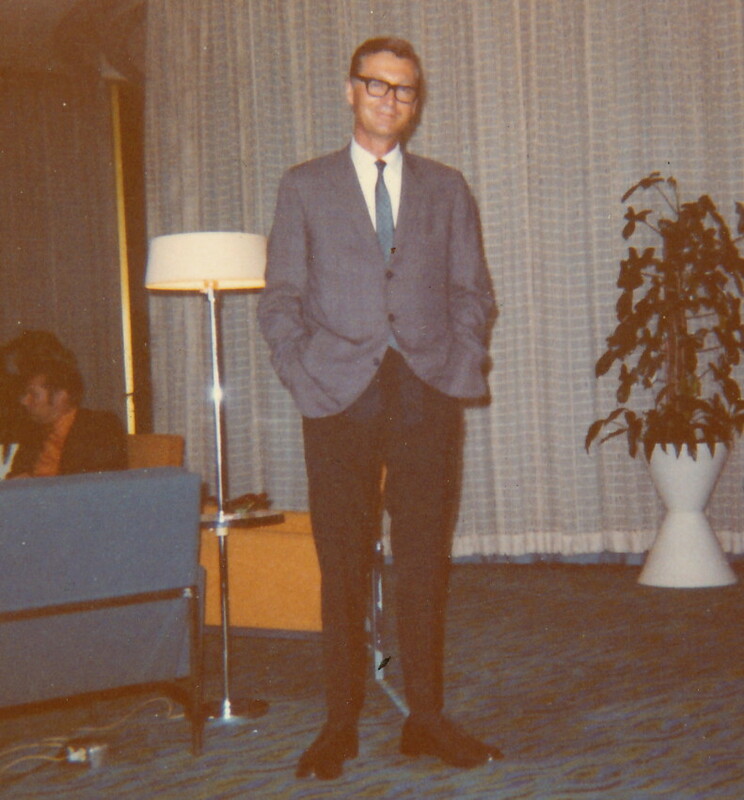 We don’t have any images of Dad at Sanibel because he was usually away on business. Here’s a photo of him in the Columbus Hotel, where we always stayed while we got our annual physicals and dental checkups. By the way, pardon the tiny photo thumbs. The new-and-improved WordPress offers you either their own predetermined thumb sizes or a customized size. If you choose to customize the size, the thumbs become blurry. Like everything else Internet, WordPress is digging is its own grave. You’ll have to ask them why they think making their product crappier is an improvement. Between Hurricane House and the famous beaches of Sanibel Island were hundreds of yards of white, bleached, pulverized seashells. They hurt your feet because they were sharp and hot. That slanted palm tree was fun and scary to climb. When you made it to the top, the whole tree got as springy as rubber. It was under the tree that Paul almost knocked out the younger Mr. Kern, who was one of those guys who always wanted kids to punch him in the stomach. In my childhood I came across at least a dozen such men. “Punch me in the stomach!” they’d say. So you’d hit this solid wall of muscle, and they’d feel all proud, I guess. Well, Mr. Kern told Paul to punch him in the stomach, not knowing that Paul was abnormally strong and obsessed with developing the most powerful punch on the planet. He punched everything, constantly. So Mr. Kern braced himself, and Paul hit him so hard in the solar plexus that Mr. Kern staggered back. He still smiled, but I could tell he was in agony. Paul had lunged like a fencer, knocking the wind out him. Mr. Kern gagged something unintelligible and walked away. I’m sure when he got out of sight, he doubled over and puked. Even though at nine Paul could almost knock adults unconscious, Tim was the one we had to keep an eye on. Go take another look at that photo of him with Charlie. That’s how Tim held us. In the ocean. He liked to dunk us. When I say “dunk,” I mean “hold us beneath the surface while we thrashed in panic.” I got my revenge on him, despite knowing it would cost me. There was a weird stretch of gooey, sulfurous mud a few feet offshore. Maybe it was some kind of fish graveyard. After several Tim-dunkings, I scooped up a double handful of this stinking slop and pretended to examine it. “Oh my God! Look what I found!” I called to Tim. He waded over. “What?” He bent down to look at the mud in my hands. “This!” I screamed and crammed it into his face. “Oolp!” he grunted as he fell over backwards, his mouth and nose filled with whatever that slimy, foul-smelling crud was. I swam like a dolphin to shore, knowing that when Tim had washed out his mouth and nose, he’d make me pay. And he did. Every few days a pair of DC-3s would fly down the beach after spraying insecticide. One morning Dad was with us kids when the airplanes made their run. We threw ourselves to the sand, but Dad just stood there as they roared over our heads at about this height. That night I had the first lucid dream I can remember. I dreamed that there was a vampire outside, looking in at me. He had a black cape, swept-back hair, and long fangs. Somehow I thought someone else was dreaming it. “Who’s having this dream about vampires?” I thought. Suddenly Mom loomed out of the darkness beside me and said, “Wake up, Tommy. You’re having a nightmare.” She clutched the front of her nightgown and seemed angry. The next morning she told me I’d been wailing, “Help! Help! There’s a vampire at the window!” I didn’t think I’d made a sound. Though Mom wasn’t actually angry at me, she was a music lover. Answer a simple question: What was my mother’s favorite song? You can find the answer by searching the “News” page. Just put in “mother’s favorite song” and you’ll get the post that reveals it. After you have the answer, send it to me via the contact form or by PRIVATE MESSAGE on Facebook. Include the title of the song and your e-mail address. With your e-mail address I can send you a Kindle version of either book. Specify which title you prefer. Chasing the Last Whale is a fictionalized black comedy about love and suicide in contemporary wartime America, and Hallucinabulia is a record of my state of mind during the loss of the Cardinal Ghost, the loss of my career in music journalism, and the loss of my father. Mom was still alive when I finished it. They’re both actually very funny and entirely lacking in self-pity. What I need now are Amazon reviews. If you’ve read any of my books, please review them on Amazon. On the 1970 Sanibel vacation, Dad bought me a rubber Tin Man from The Wizard of Oz. 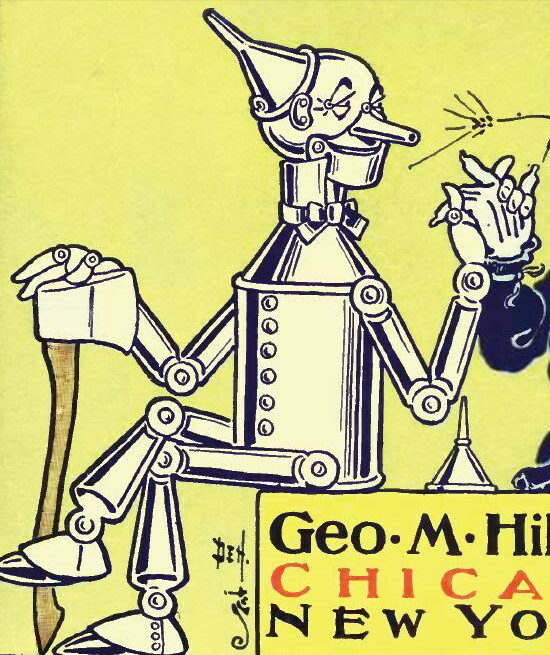 About eight inches tall, he was purple and based on the illustrations by W.W. Denslow. He was sort of like a skeleton, and I’d always liked skeletons. I’d had him for no more than ten minutes before I took him down to the beach and went into the ocean with him. A wave hit me, and I dropped him. Though the water was only three feet deep, it was so murky that I couldn’t see the sand. The Tin Man was gone. I looked for him for an hour but never found him. It was too painful and embarrassing to tell anyone. Hurricane House is still there, but it’s changed a lot. The Kerns or their heirs must’ve made a fortune selling their property to whatever developer put up that lovely edifice. If anybody goes there on vacation and finds a purple rubber Tin Man on the beach, I’ll pay you $5000 for him. And don’t try to fool me; I’ll know him when I see him. This article viewed 133 times.